CNN’s Newsroom on Thursday ran a glowing documentary-style report about a pro-ObamaCare rally on Capitol Hill that was organized by a coalition of left-wing organizations. Anchor Heidi Collins introduced the report without referencing any of the organizers, which included ACORN, MoveOn.org and SEIU. The report also featured a former Obama campaign operative who pushed for the president’s plan. These Democratic Party operatives got a glowing unpaid advertisement from CNN in the form of Moorhead’s report, but at the same time, some of the network’s talking heads, such as political analyst Gloria Borger, have also been quick to point out that conservative organizations have been helping organize the opposition to ObamaCare. On Wednesday’s Situation Room, Borger remarked that “some of them are real and some of them are manufactured,” meaning the angry protests at recent town hall events by several congressmen. She continued that “you have conservative groups out there...who are against health care reform. They’ve learned that it's very easy to organize groups via the Internet, and they’ve told people to go to places and to disrupt meetings.” When is CNN going to do state the same about the proponents of ObamaCare, such as the organizers of the Capitol Hill rally? HEIDI COLLINS: Despite the summer heat, thousands of activists have turned out on Capitol Hill to rally for health care reform. In today’s ‘Health Care in Focus,’ photojournalist Jeremy Moorhead gives us an inside look at the work and determination of volunteers hoping to make a difference. JULIE (no last name given): This is a huge undertaking. Right now, we are in Upper Senate Park in front of [points to the U.S. Capitol]- I’m the marshals’ captain- my name is Julie, and we’re going to be positioning you folks throughout this Upper Senate Park. It’s going to be a great rally. 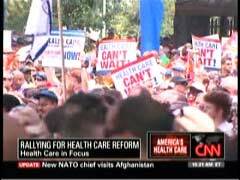 MUSIC OVER PA (to Queen’s “We Will Rock You”): We want, we want health care! JULIE: We’ve got many, many groups who are volunteering their folks. The main responsibility will be to keep the sidewalks clear. Why am I doing this? Because I support health care for all. I think health care is a right, and I think that this is a pivotal time in our history to make sure that we guarantee that. We’ve got almost 65 buses that are coming in the next two to three hours. I think that people [are] coming as far as Hawaii. UNIDENTIFIED MALE 1: Three bus loads from West Virginia. JULIE: Some of them will be going to town halls to meet with senators. There’s going to be a lot of people. MUSIC OVER PA (to Queen’s “We Will Rock You”): Come senators and congresspeople ‘round this land. It’s time to listen to the voters’ demands. UNIDENTIFIED FEMALE 1: Health care now! MUSIC OVER PA (to Queen’s “We Will Rock You”): Singing! We want, we want health care! UNIDENTIFIED MALE 1: You are- there’s more of you than we expected, which is what a movement’s about. 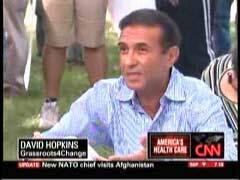 DAVID HOPKINS, GRASSROOTS4CHANGE: When you go to Europe, you get health care from cradle to grave, and here in America, the richest country in the world- and you got millions of people who don’t have health care. If they lose their job, they lose their health care. If they get divorced, they lose their health care. It’s basic stuff- why can’t we have health care? SENATOR BARBARA MIKULSKI: We need to work together to pass universal health care. There is no option but a public option. UNIDENTIFIED FEMALE ANNOUNCER: Thank you. Thank you.